(SEOUL=Yonhap News) SK hynix Inc., South Korea's No. 2 chipmaker, on Wednesday won approval for its plan to build a semiconductor cluster in the Seoul metropolitan area as the government decided to lift development regulations in the region. The update on the project, valued at 120 trillion won (US$136 billion) came after the Ministry of Trade, Industry and Energy requested the Ministry of Land, Infrastructure and Transport last month to ease regulations that limit the total size of industrial zones in the area. The plan to build four semiconductor fabrication plants in Yongin, just south of Seoul, is anticipated to create some 170,000 jobs. More than 50 subcontractors also plan to move into the cluster, energizing the regional economy as a whole, the ministry added. The ministry said it plans to provide SK hynix with all necessary support to ensure investments can move forward in a timely manner. The government will continue to make efforts to promote massive investment projects from the private sector, especially in the chip industry, which is considered a major pillar of the South Korean economy, it added. SK hynix welcomed the government's approval, vowing to closely work with local parts makers to upgrade the nation's semiconductor industry. "SK hynix will create a co-prosperity fund and establish a cooperation center based on artificial intelligence to step up collaboration with local companies," SK hynix CEO Lee Seok-hee said in a release. "The company will collaborate with more than 50 parts makers and contractors for the project to raise the competitiveness of South Korea's semiconductor industry." South Korea's exports of chips came to $126.7 billion in 2018, marking the first time that a single item posted shipments exceeding the $100 billion mark on an annual basis. The country's combined exports came to $605.5 billion last year. The state-led support team on the project plans to analyze the environmental and traffic impact of the cluster, and gather opinions of residents in the region through the second quarter of 2020. Related compensations will be paid out by the second quarter of 2021, along with efforts to excavate artifacts in case there are any. The groundbreaking of the cluster is expected to start in the third quarter of 2021, with the completion anticipated to take place in the fourth quarter of 2024. 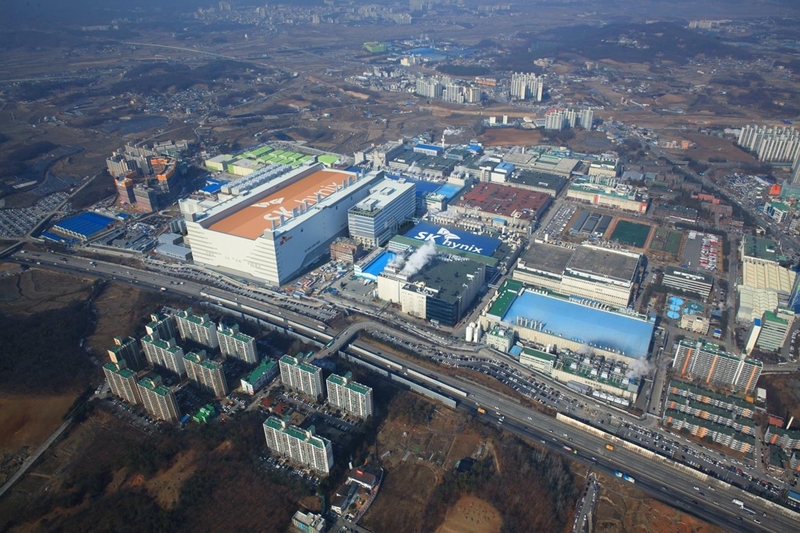 When the project is completed, Yongin will serve as a base for DRAM and next-generation memory chips for SK hynix, while Icheon, 80 kilometers south of Seoul, will serve as an R&D and DRAM hub, and Cheongju, 137 kilometers from the capital, will be a NAND flash chip center for the chipmaker.